Thanks so much to Ann over at Inkpots ‘n Quills for my first award here at From My Kitchen Table! Now for the hard bit: Ten Wonderful Blogs…. And I know that is 9… but 9 good ones! The I love owls following I hate fish sounded briefly as though you wanted to eat one! Is that illegal or just gross? Hi Barbara, love your new look blog, it's great! I'm so there with you disliking dishonesty, there's nothing worse than a liar. As for fish, I know what you mean, but I've recently started eating it on the doctor's instructions for a healthier diet and am slowly but surely getting used to it. One thing I also love, smell of freshly cut grass, it may be sad, but I don't care:) My favourite place, Vancouver. Canada, how I miss you! OMG EW – I don't want to eat an owl. Lol. I want one – for my garden, so I can hear t-wit t-whoo every night and see his eyes in the dark. And just know that he is there. Thanks Olive – yep cut grass one of my lovely smells also. And Vancouver is on my must visit list. Would love to go! Enjoyed reading your ten Honest points! Funny you mentioned angels…working on a story with an angel theme. My favorite place is Tuscany. Hope you fulfill your desire to visit the Carolina's. Happy writing and I'm really curious about Ann's angel story, want to read it soon ! Anne – I am with Brigid on wanting to hear more about your Angel story – or hear the story itself…. very curious. And Tuscany – ohhhhhhhh…. wanna be there now! The other thing that strikes me is how many people believe in Angels? Interesting!!! I enjoyed reading your 10 things and I am with you on numbers 5 and 7 – never suprise me, ok and I promise never to suprise you – deal? Oh, and by the way, I have heard that fish speak very highly of you – so where did it all go wrong! 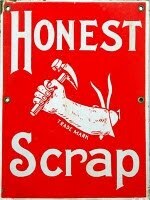 Thanks very much for passing on the honest scrap to me – Ann has passed one to me too – eek! does that mean I have to think of twenty honest things!!! (Mmmm, I may have to rethink my stance on number 5.) lol! Ah ha Susannah – a fellow control freak? Very impressed with your honesty! And don't believe a word that fish tell you – they are terrible liars! And finally yep – a list of 20 things from you… off you go! Will be over to your place later for a read! !